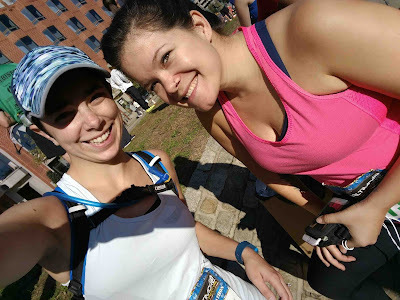 Yet another long, completely not book-related running recap. I make no apologies. Welp, it's another one in the books. 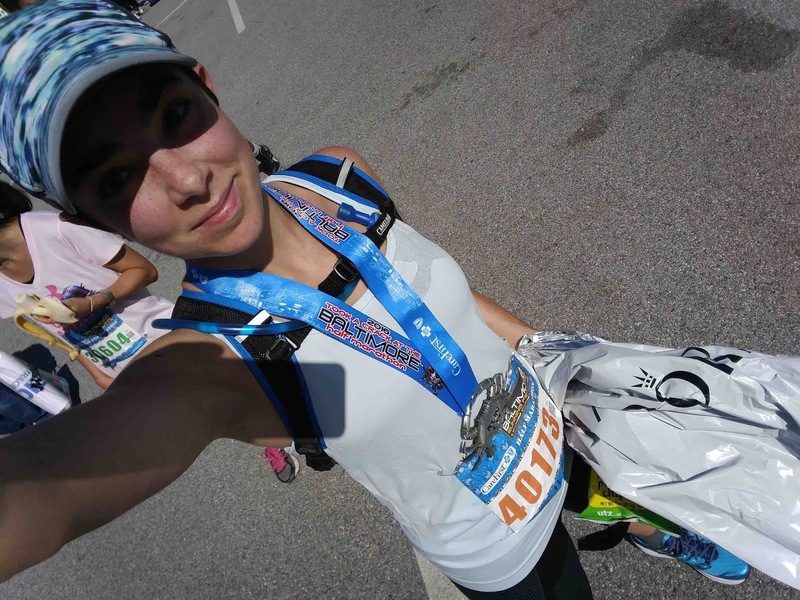 Two weeks ago, I ran my seventh official half-marathon. Because of travel, I wasn't able to make it back to the Freedom's Run half-marathon this year, so I set my sights on the Baltimore half marathon instead, held two weeks later as part of the annual Baltimore Running Festival. The upsides to Baltimore: the festival is sponsored by Under Armour (a Baltimore-based company), which means great premiums (usually). 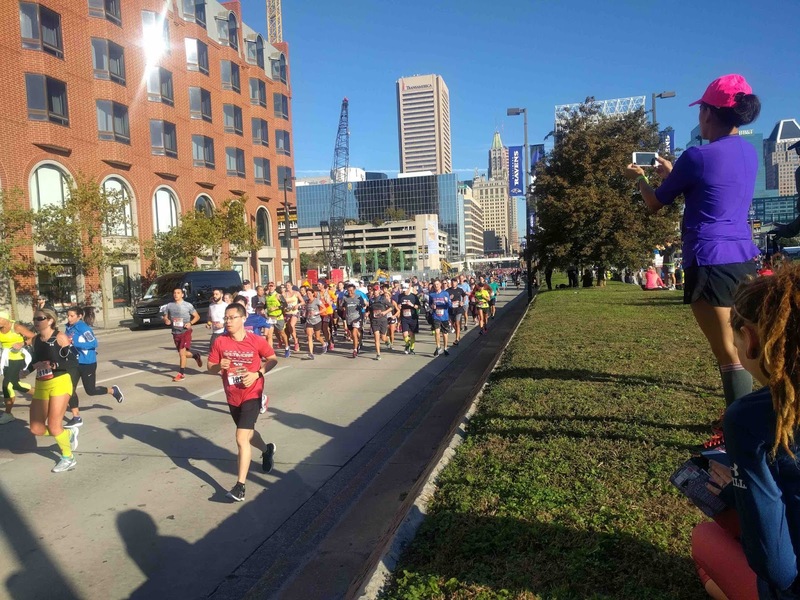 On top of that, the Baltimore races are put on by the same company that puts on the Frederick half marathon, so there are incentives (discounts, extra medals, and prizes) for participating in multiple events in the series. And because Baltimore is a chock full of people that love their city (despite national media attention that might suggest otherwise), the streets are pretty well lined with supporters throughout most of the course. There are downsides, though, the largest of which being that the race starts a solid hour from my house (and bib pick-up is only available in Baltimore, not at any satellite locations or by mail or morning-of). The half-marathon also has an exceptionally late start time, with the first heat going out at 9:45am. These logistical nightmares had me less than excited about the race leading up to race day, and unfortunately, I never quite got my head in the game. Which brings me to race morning: I left my house at 7:00, worried about city traffic and parking issues due to road closures (the full marathon started at 8am). I'd pre-booked a parking spot that was seemingly easy to get to around road closures, but Baltimore's highways leading into (and out of) the city are notoriously backed up at odd hours, so I prepared for delays. Of course, there were none... so I was in my spot at 7:53, staring down nearly two hours before my race start. And it was cold out at that hour--about 48--so I sat in the car and listened to NPR while eating an english muffin (I had no idea how to fuel for a race start this late in the day). Around 8:45, I pulled on an extra sweatshirt and went to find port-a-pots (bonus! This early, I was practically the first person to use them, as the 5k hadn't quite ended yet and most half runners weren't yet arriving). To kill extra time, I went back to my car to drop my hoodie (as the sun came up, it got warm fast, and I realized I didn't need the extra layer to stay warm at the start line... which isn't a great sign for a long race). when your friend from college is a Baltimore native, you get to see her at the start line! Around 9:00, I was basically lined up and ready to go... and in hindsight, I'm glad I got to my start as early as I did. Turns out, the full marathon course passed by the start of the half start not long after, so I got to watch the front runners speeding on by, and kept my eyes peeled for a few running group friends who were running the full (I managed to spot--and shout for!--two of them in a very crowded field, so I was pretty pleased). I also avoided the madness of having 11,000 half-marathon runners cross the course of a 4,000-person marathon to get to their start; Corrigan, if you read this, there has *got* to be a better way to arrange that. Because of my predicted finish time, I was in the 4th heat--which meant I didn't start until about 10am. Within a mile, the course looped out of the Inner Harbor business district and into more neighborhood-y areas of Baltimore; for those familiar with the city, you might understand why that time + that course quickly became an issue. There was almost no shade for miles 1-12, and it was 68 degrees by the time I finished. 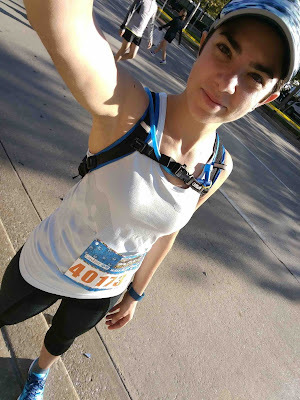 I was hot (thank god I opted for a tank top) and fighting a dehydration/sun glare headache within a few miles. Luckily I fell in with a running buddy from my running club and we kept pace for the first 9 miles or so, generally taking it easy (aiming for a 10:30 pace) and running the hills. Oh! And! The finisher medal is really freaking cool. (Though I was supposed to get a second medal for completing the Maryland Double (both Frederick and Baltimore), and I was ushered out of the medal corral without managing to get to the volunteers with the Double medals. Final verdict: This wasn't really the race for me, but if you like large races with continuous crowd support, definitely check out the Baltimore Running Festival. Just be prepared for the logistical difficulties that come with large races.